Do you know that feeling when you are on top of the world? Well, I never had a stronger one than when I was looking on NYC from Top of The Rock at Rockefeller Center. 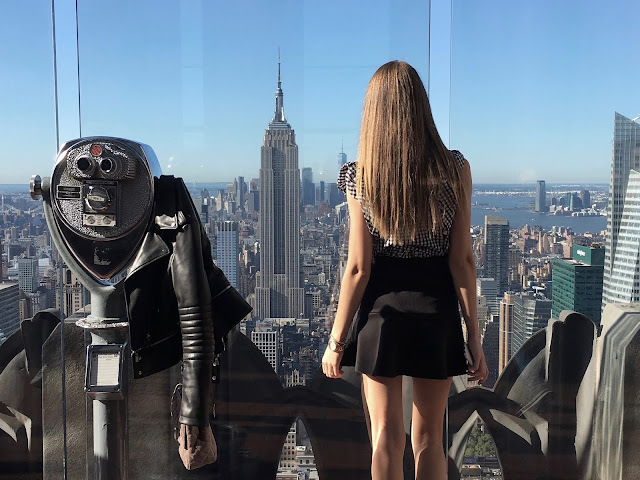 The view is incredible, and when you are in NYC next time I highly recommend checking it out. You can see Empire State building, Manhattan's midtown and downtown, Central park and even Statue of Liberty. Standing on seventies floor and watching this amazing city, just charges you with unbelievable energy. The whole time I was there I was wondering what would it be like to wake up every day to this view. I don't think anyone can ever get tired of it. I was walking a lot around the city, so comfortable shoes were no brainer, and thats where my Superstar sneakers came handy. Even though my outfit is comfy, it also has to be stylish. That's why I paired a-line skirt with checkered top and leather jacket. Everything is linked below. If you ever been to NYC, let me know your favorite places to see.